Could you share with us the dynamics of writing with a co-author? LAURENCE: I’ve had different collaborators on other projects. Most of them were scripts, and that’s easier: no one ever reads your stage directions, so they don’t have to be that well-written. But, with novels, strangers are going to be reading every word, so you end up, side by side, going over every one. The important thing is to agree that the book means more than any (brilliant) individual idea either one of you might have. Also, learn to apologize and to accept an apology. As a last resort, turn on the news—or think about your friends or relatives who are sick or broke—and get some perspective on life. Then kiss and make up (depending on who your co-author is). SUSAN: The one thing I can kind of compare it to happened when I was a kid and I was competing in a 3-legged race with my friend, Leslie. Everyone around us was going through their strategies for winning (which leg to start with, where to put their arms), and we were convinced we were going to lose. So I looked at her and said, “just run as fast as you can.” We did, and by some weird fluke we fell into sync and won. I’m not saying writing is that easy, because obviously, it’s not… but you do have to trust that the other person is working as hard as she or he can. And so are you. Because that’s the ONLY way it’s going to work. What do you think are 5 essential things for surviving the apocalypse? 1) Something to start a fire with, preferably one that doesn’t need fuel. Back when I smoked, I had a really cool/dorky lighter shaped like a little metal dish that used the rays of the sun to light your cigarette. Something like that would be super useful. 2) Salt. It not only will make your terrible food taste better (i.e. pigeons, rabbits, opossums, blecchh), you can also use it to clean things. Kind of. 3) A hunting slingshot. Because any dummy can use one of those and you’ll need it to get dinner, scare off trespassers, and kill hostile zombies. 4) Really good sunglasses. I’m assuming the apocalypse would have some kind of climate change/global warming component to it, and besides, too much sun is murder on your eyes. I also get killer migraines, so it wouldn’t just be a fashion statement. 5) Access to books. It should be easy to find—a good library, a Barnes & Noble. Books represent everything: not only entertainment and instruction, but hope and even a possible way to rebuild a workable future. Thank you to the ever amazing Jenny @ Supernatural Snark for doing all the hard work and organizing this tour. 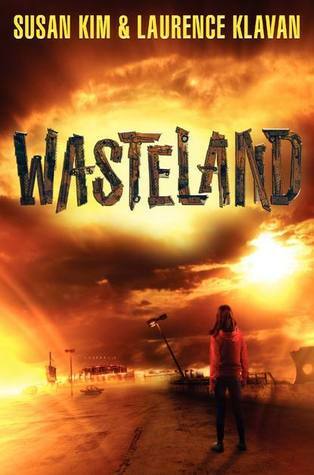 Thanks to HarperTeen, three winners will each receive a copy of WASTELAND. Each tour stop will post the same Rafflecopter giveaway for people to enter. Giveaway is US only. Thanks, Maggie... hope you like it! I'm reading this book this weekend! Can't wait. I can't even imagine writing with a partner. Of course, I don't play that well with others but I'm always impressed by those who can! LOL! Yeah, we definitely think writing together is one of those don't-try-this-at-home things... super difficult. Hope you enjoy the book, Mary! Salt! I wouldn't have even thought about that, but yes, it would definitely make whatever foul food I would have to eat taste a little better. And yes to books. I would definitely need to escape in a book every now and then to keep me sane in a world like this! Thanks so much for being a part of the tour Maja! You're the best, Jenny... thanks for everything! I always imagined it would be hard enough to write a book on your own but throw in the opinion and ideas of someone else and it would be chaos lol! I am glad the authors were able to come together though and create something really unique and different. I actually really enjoyed this one and will definitely be reading the next two books. HA I like the three legged race analogy, totally makes sense in this case. I imagine co-writing wouldn't be the easiest thing in the world because no two people are exactly alike, but I think bringing the two ideas together is neat and can truly create something fascinating. Thanks for sharing! I am down for a bottle of Xanax or Valium or something like that. I honestly hope if the Apocalypse comes that I am at ground zero and obliterated right away cause I am a wuss. I hate camping. A flashlight is great until the batteries die but I guess it is good for bashing skulls. I was thinking sunglasses wouldn't be help if it was an ice thing, but then I remembered oh yeah when and if the sun comes out snow glare is the worst! Great tips thanks for sharing. I already read and reviewed this one so I didn't enter. Thanks for the interview and the blog tour. It's great way to know about authors and books I didn't know about. lol! A 3-legged race. That's actually a great was to describe it. I don't think I could ever write a book with anyone (I'm too much of a control freak for that!) and I always admire authors who do it so well. I love Susan's 3-legged race analogy! I'm reading an apocalyptic book at the moment, and went to bed last night thinking about how pathetic my survival skills are. I'd probably be one of the first to die. ;) Thanks to Laurence and Susan for sharing their lists! Books are essential. Maja -- thanks SO MUCH for featuring us on your blog! It's pretty awesome and obviously, so are your readers. We really appreciate it! I can't imagine writing a novel with someone else and I'm in awe of people who can do it. There are a handful of writing teams that seem to have found the right formula for them, and its great that Laurence and Susan were able to make it work as a team. "I think the best person to survive an apocalypse is someone who’s paranoid and a trained survivalist." YES, I am going to look for the person whose been crying conspiracy and apocalypse for ages because you know they have a basement full of canned goods and bottled water. I'd bring the entertainment (mostly a ton of books), they can be the mountain man/woman survivalist. Books, pills, flashlights, blankets, clothes, water, food, weapons, shelter and yeah got to agree with sunglasses if the weather is sunny. I would probably end up having to burn the books for warmth and cry. Then the pills to end the suffering. LOL I would never survive the apocalypse. I'm seeing this one around with the tour. It does have a great sound to it. It's got to have great patience and cooperation to work as a team. Great job! Same here. Sounds good to me.